China, 2000 years ago. Loyang has risen to become the capital of the Han Dynasty and one of the four main capitals of ancient China. In the booming economic climate, the people of this flourishing city require an improved supply of basic foodstuffs. These are supplied by local farmers who grow wheat, pumpkins, turnips, cabbage, beans and leeks in their fields. 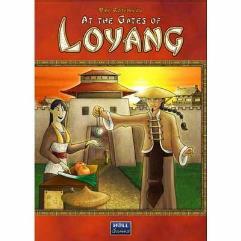 After each harvest, the farmers regularly meet at the gates of Loyang to trade their produce. They make deliveries to their regular customers and sell vegetables to casual customers for lucrative profit. But vegetables can also be bartered at market stalls or used as seed to plant new fields. If the farmers need vegetables which they don't have on hand, they can buy them at their shop. The most successful farmer will be the one who makes the most progress on the Path of Prosperity within the given timeframe. Each step along the path costs money -- less to begin with, increasingly higher amounts later on. But money is also needed for investments -- so it is crucial to strike the right balance. Although easy to learn, At the Gates of Loyang is a challenging economic game for 1 to 4 players.